After eleven long years, the end game is finally here. In just about two weeks, the biggest movie of the year -- scratch that, make that the biggest movie of the decade -- 'Avengers: Endgame', is set to open in cinemas nationwide. The hype for the movie was so crazy, we heard that tickets to the first day of screening completely sold out all around Malaysia. In fact, in the US of A, scalpers are selling first day tickets for as much as USD15,000 (RM61,474)! Of course, 'Avengers: Endgame' is not your usual superhero movie - it's the superhero movie. 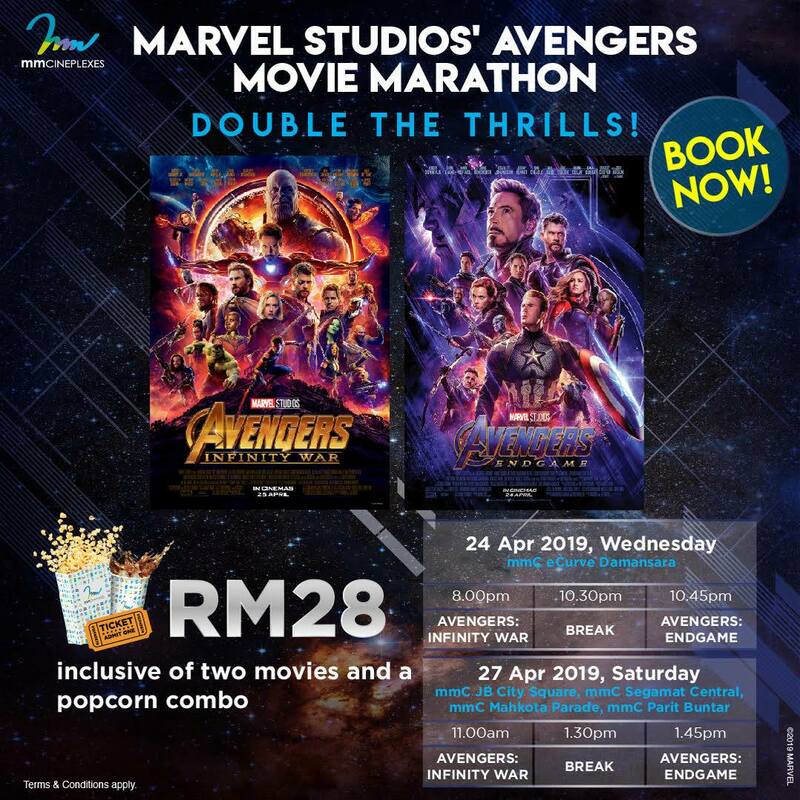 So, it's perfectly normal if you feel like splurging a little bit extra (not RM61,474 extra, though, because that's just nuts) to catch the final 'Avengers' movie. 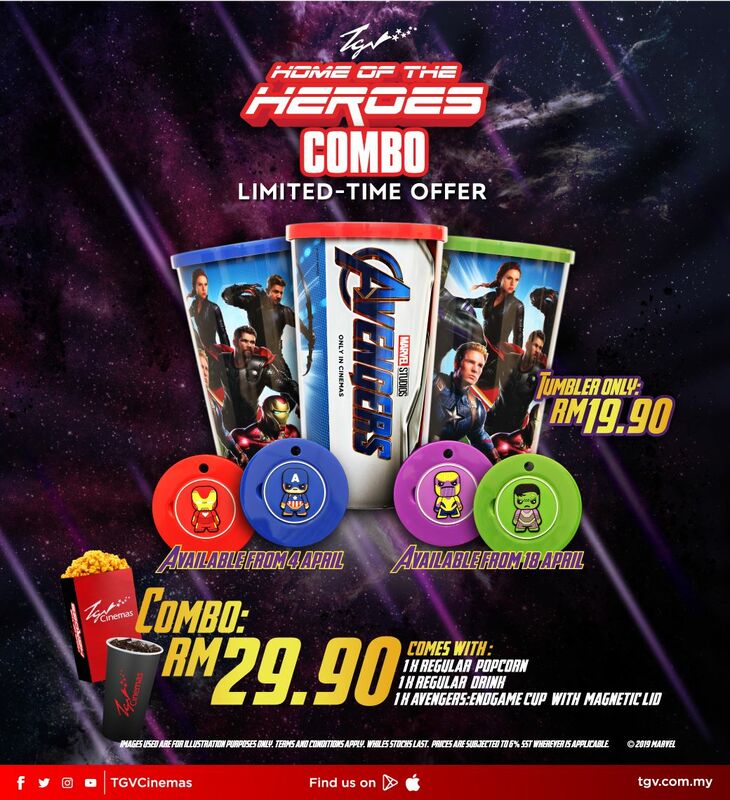 Therefore, we took the liberty to round up all the best 'Avengers: Endgame' popcorn promo each and every cinema operator in Malaysia is offering. From limited edition collectibles to bobble head figurines and special edition popcorn boxes, you'll have plenty of special edition stuff to bring home with you. Think of it as your reward for surviving the end game. Here comes the bobble heads! 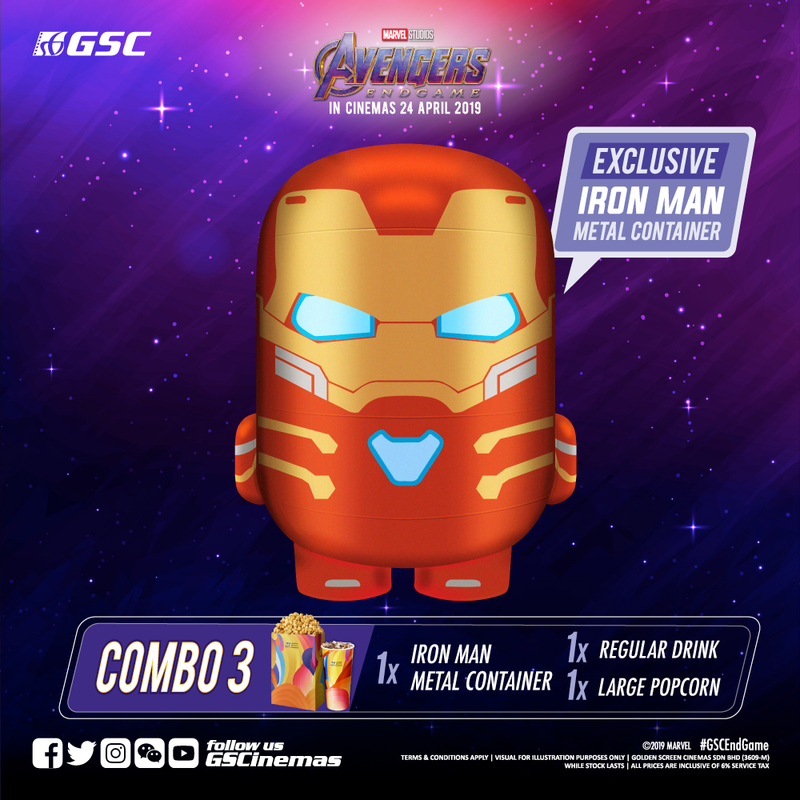 GSC is offering cinemagoers limited-edition tumbler combos featuring some of our favourite Avengers. 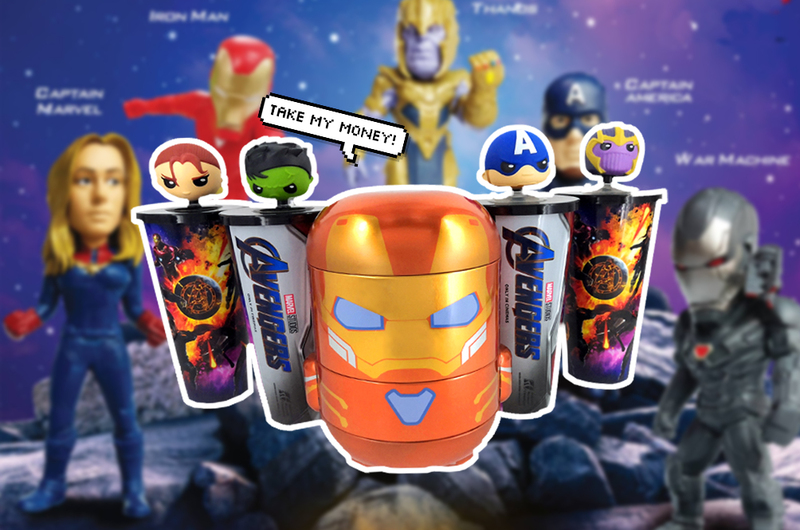 These tumblers capture the mug of Captain America, the Hulk, Black Widow and the Mad Titan in cute bobble head forms, which are affixed to the lid of the tumblers and can be detached for use separately. Each set, served with popcorn and a soft drink, sells for RM28. But the one collectible we have our eyes on is that sweet Iron Man metal container. You could use it to keep your small items, such as coins, jewellery, your hopes and dreams, etc. And here's the thing: this limited edition metal container is Malaysia exclusive, which means you will not be able to get it anywhere else. BRB, gonna go buy all of them now and sell to you guys in the black market (insert evil laugh). This special combo, which comes with a regular soft drink and a large popcorn, is available from RM45. But if you want to collect them all like how Thanos collected all the Infinity Stones, you could get the entire set for just RM138. The sets are on sale now, so just head over to their website or any GSC cinemas nationwide (except the one in Terminal 1, Seremban) to get them. 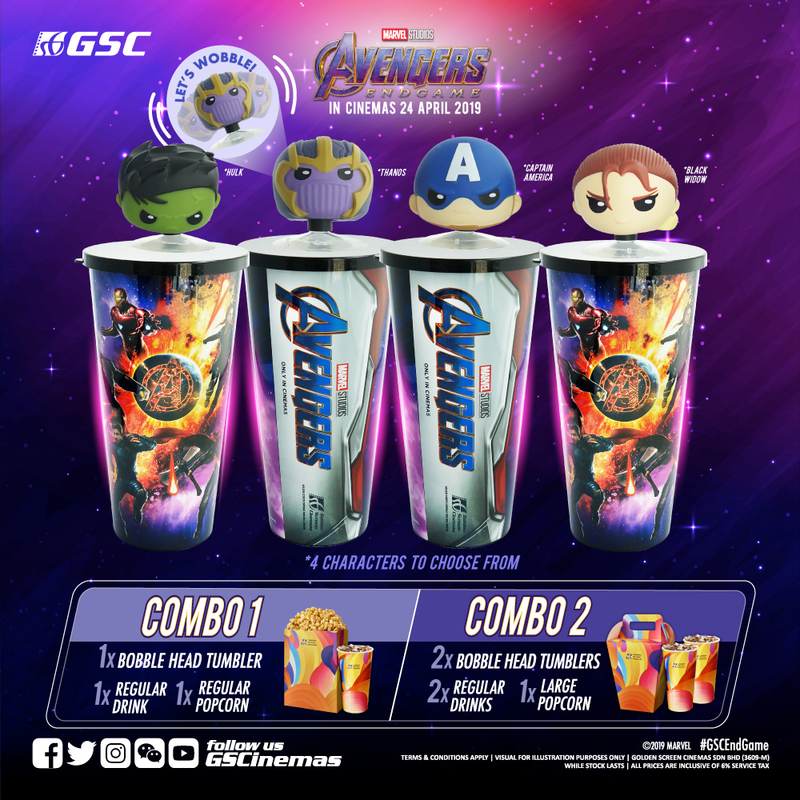 Like GSC, TGV Cinemas will also be releasing limited edition 'Avengers' tumblers to celebrate the release of the film. The tumblers feature the cartoon caricatures of Iron Man, Captain America, the Hulk and Thanos on the magnetic lid. The Iron Man and Captain America ones are available now, while the Hulk and the Thanos ones will be available starting from 18 April onwards. Each set retails for RM29.90, and comes with a regular popcorn and a regular drink of your choice. If you want just the tumbler, it's only RM19.90. We don't know about you guys, but we think the tumblers look kinda...meh. Come on TGV, you can do better. Thankfully, MBO Cinemas has decided not to go the tumblers route because how many tumblers can we buy, right? 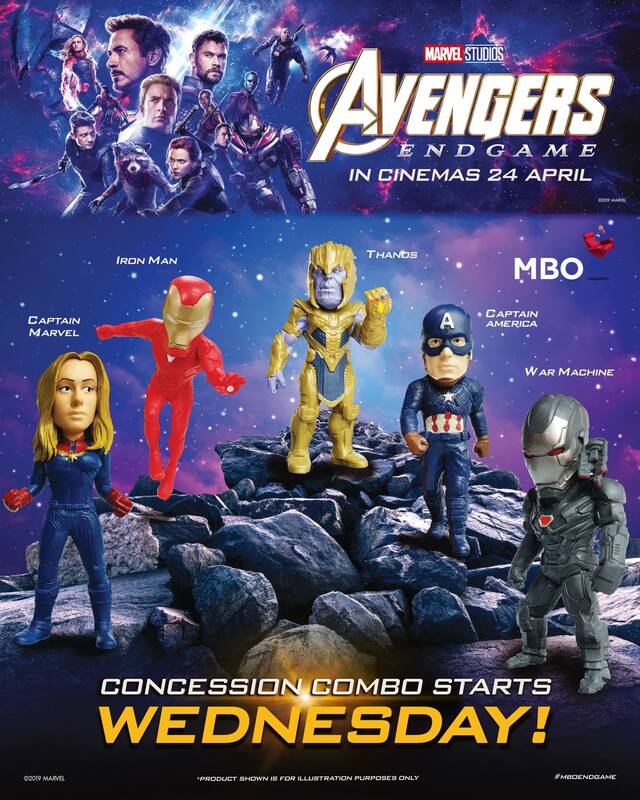 For 'Endgame', MBO Cinemas will be releasing a series of mini (or big?) figurines featuring Captain Marvel, Iron Man, Thanos, Captain America and War Machine. They have yet to release any information on the promo yet though, so we would have to wait awhile longer to find out how much these figurines are going to cost us...or if they are worth getting at all. BTW, what's wrong with Iron Man's legs? Did he skip leg day or something? We know what you're thinking, what and where is mmCineplexes? To make it easier for you, it's that cinema in eCurve. And yes, it's still there. We didn't manage to find any 'Endgame' promo from mmCineplexes (maybe they haven't announced it yet?). However, they are running an epic 'Avengers' marathon featuring two films: 'Avengers: Infinity War' and 'Avengers: Endgame'. For only RM28 per person, you'll get to watch 'Infinity War' at 8pm on 24 April, and 'Endgame' at 10.45pm. The same marathon is also available on 27 April at JB City Square, Segamat Central, Mahkota Parade and Parit Buntar. The fee includes a popcorn combo, by the way. If you're looking to refresh your memory before you catch 'Endgame', head on over to mmCineplexes.